The IBM Champion Lifetime Achievement award recognizes an IBM Champion who stands above their peers for service to the community. Over multiple years, these IBM Champions consistently excel and positively impact the community. They lead by example, are passionate about sharing knowledge, and provide constructive feedback to IBM. 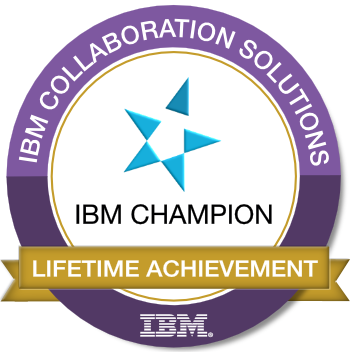 The Lifetime Achievement award provides automatic re-nomination into the IBM Champion program for the duration of the program, plus other benefits. To earn this badge, the individual must be nominated and selected as an IBM Champion. One or more members of the IBM Champion selection committee must then nominate the individual for this award. A recipient must be distinguished from their peers by extraordinary contributions to the community in one or more key areas, from running user groups and events, to consistently sharing knowledge via these events, blogs, and social media.